some of them are believed to use a special type of fusion power. they are much smaller than any normal star. LIFE on red-dwarf planets possible? they are common! the next one is GLIESE 581C, about 10 light years away. 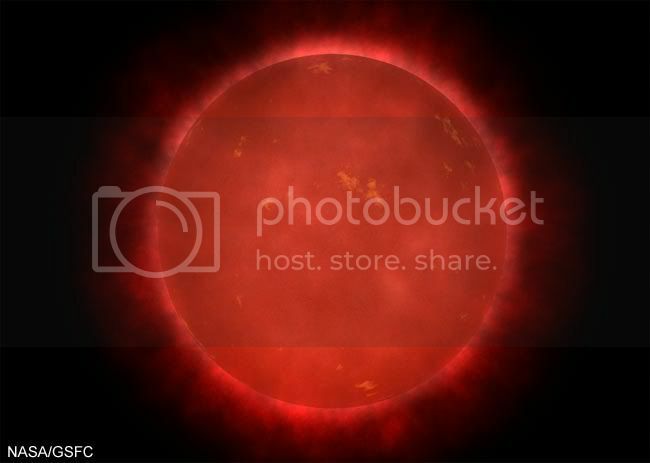 red dwarf can be upto 30 percent of our sun, usually only 10 percent, or less. the energy can be 1/1000, or 1/300000 of the sun’s energy! A “failed star” with only 24 times the mass of Jupiter is the smallest known object to spout jets of matter from its poles, a phenomenon typically associated with much larger black holes and young stars. The new finding, detailed in the current issue of Astrophysical Journal, confirms that a wide range of celestial objects is capable of generating such outflows. “There are black holes that are 3 million solar masses spewing jets, and there’s this thing, which is 2 percent of a solar mass, doing the same thing,” said study team member Ray Jayawardhana of the University of Toronto. The discovery also raises the possibility that large gas giant planets like Jupiter or Saturn might also have been gushers some time early in their history. The new jet-spewing object is a previously identified brown dwarf！celestial objects with masses between 13 and 75 times that of the Jupiter, too massive to be a planet but too small to sustain the internal nuclear fires needed to become stars. 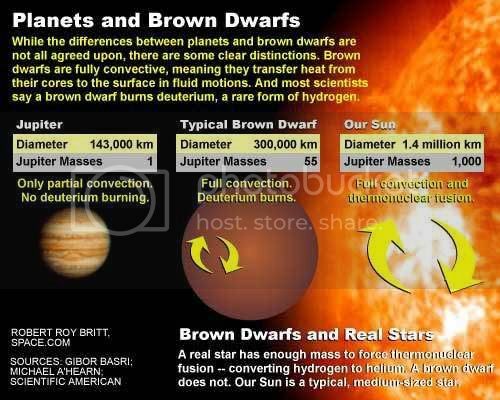 For this reason, brown dwarfs are sometimes called failed stars. Called 2M1207a, the spurting brown dwarf is ringed by gas and dust, similar to the protoplanetary disks from which planets form around young stars. Indeed, 2M1207a is known to harbor a 5-Jupiter-mass planetary companion. Called 2M1207b, the gas giant was one of the first planets outside of our solar system to have its picture taken directly. 2M1207a’s streaming jets were discovered using the European Southern Observatory’s Very Large Telescope (VLT). The jets extend about 620 million miles (1 billion km) into space and are speeding away from the brown dwarf at a few kilometers per second. “Preliminary results suggest that a brown-dwarf jet is just scaled down from what we see in a low mass star,” said study leader Emma Whelan of the Dublin Institute for Advanced Physics in Ireland. In 2005, Whelan’s team discovered the first jet-spewing brown dwarf, but that one was about 60 Jupiter masses. Scientists are still not sure of the role jets play in star formation. One idea is that by ejecting large amounts of material into space, the jets help determine the final size and mass of the star. The new gushing nature of 2M1207a could help shed light on how jets are formed and sustained. Because 2M1207a is so small, the discovery suggests gas giant planets in our solar system and beyond could also drive outflows. “It seems like almost any time you have accretion disk around an object, some of the material that’s accreted is also spewed out,” Jayawardhana said. Both Saturn and Jupiter are thought to have grown out of accretion disks. Saturn’s disk is still clearly visible in the form of its rings. Some theorists have proposed an alternative scenario for planet formation different from the standard model in which large gas planets can form from gravitational collapse similar to stars. If a jet-spewing gas giant were ever spotted, it would be evidence of another common similarity between star and planet formation. 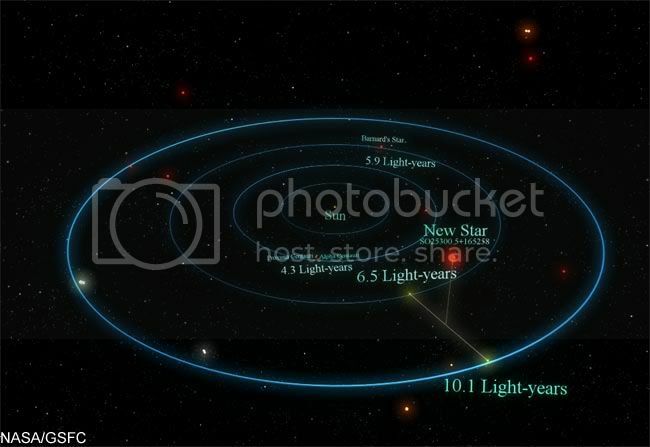 Jayawardhana said it is too early to draw that connection, since the new observations pertain only to brown dwarfs. “I would say this is explicitly a similarity between brown dwarfs and stars,” he said. Liquid water is a key ingredient for life as we know it. The newfound planet is located at the “Goldilocks” distance！not too close and not too far from its star to keep water on its surface from freezing or vaporizing away. The new planet is about 50 percent bigger than Earth and about five times more massive. The new ＾super-Earth￣ is called Gliese 581 C, after its star, Gliese 581, a diminutive red dwarf star located 20.5 light-years away that is about one-third as massive as the Sun. Gliese 581 C is the smallest extrasolar planet, or ＾exoplanet,￣ discovered to date. It is located about 15 times closer to its star than Earth is to the Sun; one year on the planet is equal to 13 Earth days. 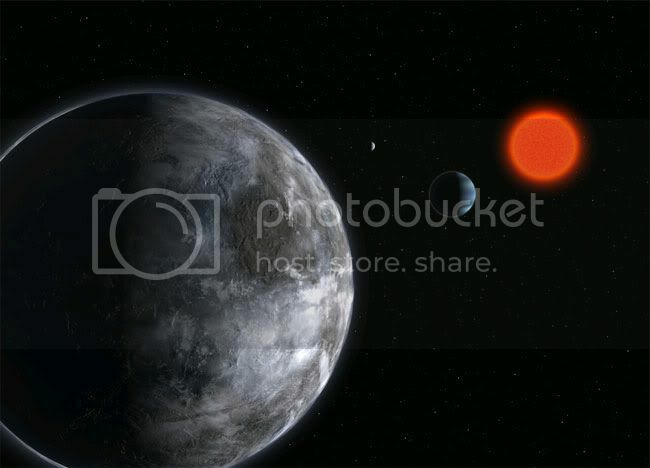 Because red dwarfs, also known as M dwarfs, are about 50 times dimmer than the Sun and much cooler, their planets can orbit much closer to them while still remaining within their habitable zones, the spherical region around a star within which a planet¨s temperature can sustain liquid water on its surface. Because it lies within its star¨s habitable zone and is relatively close to Earth, Gliese 581 C could be a very important target for future space missions dedicated to the search for extraterrestrial life, said study team member Xavier Delfosse of Grenoble University in France. ＾On the treasure map of the universe, one would be tempted to mark this planet with an X,￣ Delfosse said. Two other planets are known to inhabit the red dwarf system. One is a 15 Earth-mass ＾hot-Jupiter￣ gas planet discovered by the same team two years ago, which orbits even closer to its star than does Gliese 581 C. Another is an 8 Earth-mass planet discovered at the same time as Gliese 581 C, but which lies outside its star¨s habitable zone. ＾We have estimated that the mean temperature of this super-Earth lies between 0 and 40 degrees Celsius [32 to 104 degrees Fahrenheit], and water would thus be liquid,￣ Udry said. The scientists discovered the new world using the HARP instrument on the European Southern Observatory 3.6 meter telescope in La Sille, Chile. They employed the so-called radial velocity, or ＾wobble,￣ technique, in which the size and mass of a planet are determined based on small perturbations it induces in its parent star¨s orbit via gravity. Udry said there was a fair amount of time between the calculation of Gliese 581 C¨s size and the realization it was within its star¨s habitable zone. ＾That came at the end,￣ Udry said. When it did hit him, Udry knew he would be spending time fielding phone calls from the media. ＾You right away think about the journalists who will like it very much,￣ he told SPACE.com. Charbonneau also praised the team¨s technical skills. ＾The wobble induced on the star by each of these planets is really tiny！it¨s just a few meters a second. That means their measurement precision is exquisite,￣ he said. David Latham, another astronomer at Harvard-Smithsonian CfA, echoed other scientists¨ praise of the discovery but said the next step is to find a similar world where the orbit of the habitable planet carries it between Earth and its parent star. This will allow scientists to observe it using the transit technique, whereby the small dimming starlight caused by the planet¨s passage across the face of its sun can be used to calculate its size. Alan Boss, a planetary theorist at the Carnegie Institution of Washington, said the new planet¨s potential for liquid water made it ＾fascinating.” Gliese 581 C ＾is the closest planet to another Earth that has been found to date. I hope the SETI folks are listening,￣ Boss said. Seth Shostak, a senior astronomer at the SETI institute, said the Gliese 581 system has in fact been looked at twice before for signs of intelligent life. The first time was in 1995 using the Parks Radio Telescope in Australia; the second time occured in 1997 using the Greenbank Radio Telescope in West Virgina. Both times revealed nothing. ＾You could say it¨s going to the head of the class,￣ he said.